Each September the Seattle Firefighters Pipes and Drum Band goes to Colorado Springs, CO for the annual IAFF Fallen Firefigher Memorial. This is an event to honor and recognize those firefighters across the United States and Canada who have made the ultimate sacrifice while serving their community. Unfortunately this year, the Seattle Fire Department will be putting on the wall three of our own members. This fundraiser allows the band to pay for airfare and lodging for those members who go. 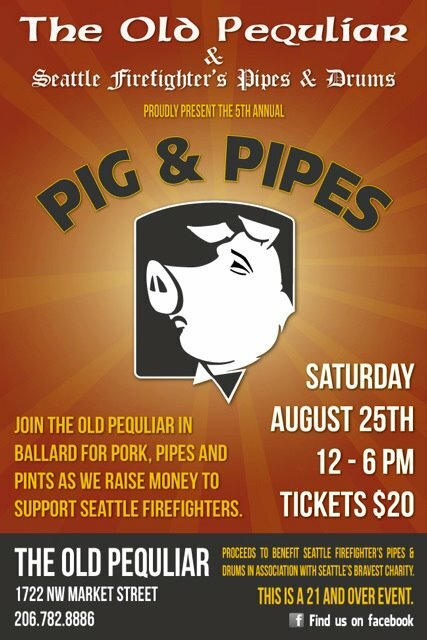 If you would like to go to Pig and Pipes, please contact Hill Almond at halmond@iaff27.org to purchase your ticket. The cost is $20. If you cannot go, but would like to support the cause, please visit the band’s website and make a donation. Seattle Firefighters Pipes and Drums is a part of Seattle’s Bravest Charity.